TAPAUS and DDB are joining Nordic Business Forum 2016 with a joint partnership. As one of the speakers at Nordic Business Forum 2016 is Tony Hawk, skateboarding World Champion for 12 years in a row, you might expect there will be something related to skateboarding in the event. That is a thought that also crossed the minds of our event partners TAPAUS and DDB. 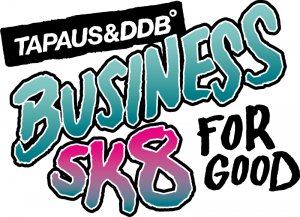 As a part of out their event partnership, TAPAUS and DDB will organize a charity skateboarding event called Business Sk8 For Good where the next generation of business influencers come together in a mini ramp jam. The event will take place right after the second seminar day. Tony Hawk will be there to judge the mini ramp contest finals. “We have reached an age where many corporate and executive professionals have skateboarded in their youth. Many are making a comeback and rediscovering their beloved sport again. We feel that we should and could spread this positive culture and vibe in a form of responsible corporate social actions. We try to enable this experience for the future generations who would gain the most from it. Our aim is to use this opportunity to raise funds and channel resources to produce skateboards for the low-income youth and organise classes for beginners together with the Finnish Skateboarding Association. This our chance to do good and give back to the culture that has given us so much in a form of creativity and self-expression.” Timo, Lauri & Rainer – TAPAUS & DDB.